You've found one of the premiere DJ services in Pittsburgh. Our decades of experience, combined with state-of-the-art sound and lighting systems is guaranteed to provide a result beyond your expectations. Count on us to deliver the perfect wedding DJ experience! 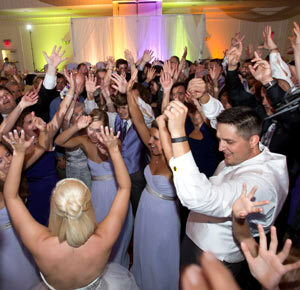 All Pro DJs - Our professional Pittsburgh DJs produce an atmosphere of fun and excitement that will make your wedding reception the party you expect! Customized Playlist - We will customize the music and format based on what you like! State of the Art Equipment - Great sound and lighting combined with the expertise of our DJs will keep your guests on the dance floor all night long. Ceremonies and Cocktails - Elegant music will set the atmosphere as guests arrive. Use our Ceremony Music Planner to customize everything from the Prelude to the Recessional. UpLighting - Give your ballroom a real "wow factor" by adding LED wireless UpLighting. Photo Booths - The hit of every reception. Large photo strips, fun props, and our popular keepsake scrapbook are all part of the package. Pre-Planning - Our Reception Planner makes it easy to work out all the important details in advance so everything goes smoothly on your special night. Preferred Vendors - ALL PRO DJs are on preferred vendor lists at the most prestigious hotels and country clubs in the Pittsburgh area including The Hilton Garden Inn Southpoint, Embassy Suites, Doubletree, Hyatt Regency, Omni William Penn, Sheraton Station Square, Marriott City Center, Valley Brook Country Club, Southpointe Country Club and Oakmont Country Club. There's a reason that AllPro DJs are Pittsburgh's premier wedding DJs. We go beyond standard DJ services to provide an experienced DJ, a true Master of Ceremonies, skilled in assuring that your wedding reception blossoms as a lively, memorable, and yet comfortable event for everyone. It will feel “just right” and our greatest reward is that all the compliments for a perfect evening will be yours to enjoy. AllPro DJs provide Wedding DJ and Media Event Services throughout the Pittsburgh region, including: Greensburg, Monroeville, Pittsburgh Airport Area, Coraopolis, Moon, Pittsburgh South Hills, Upper St Clair, Mt Lebanon, Pittsburgh North Hills. Cranberry, Warrendale, Washington, PA, and Uniontown.